With Batman vs Superman not hitting the mark, a lot of expectations are pinned on Captain America: Civil War for the superhero crowd storming the theaters. Nevertheless, we always look forward to this genre for the larger-than-life characters to infuse entertainment into our daily routine. Hence, I finally decided to visit Hungry Heroes, a superhero themed cafe situated at Tessensohn Road in Little India. Located in an unassuming alley, the cafe lights shone bright through the dark night. They have a cool logo that looked quite interesting. There are fewer options for vegetarians on the menu but my fascination to explore a different dining ambiance led me to this place. This two floor cafe has the decor nailed to the T. Large figurines adorn the walls – most of the superheroes are from the owner’s personal collection. There is a huge chandelier made with tiny superheroes stuck together. The place is a delight for fans of superhero memorabilia – there’s a lot to look at and admire. Needless to say, this cafe is quite a hit with children and a good option if you want to throw a birthday party for large groups. The placemats were newspaper style and quite hilarious to read. They helped in bringing the superhero world to the forefront on the table. As a refreshing summer salad, we ordered the ‘Super Corn-y’ salad which was fresh corn shucked from the cob and served along with a tangy twist. The charred effect on the cob was definitely a hit and the tomatoes and onions lent balance to the salad. As a complete no-brainer, I had to try their (only) vegetarian burger offering called ‘Mario’s Lifeline’. Neatly stacked with layers of vegetables on the breaded and fried portobello mushroom, this burger was damn good! I was glad the the mushroom patty had a crisp bread covering which gave the necessary bite to the burger. Having said that, I really wish F&B outlets think of using ingredients like beetroot, chickpeas, zucchini etc. instead of the traditional mushroom offering everywhere. (Just a thought!) The fries and the side salad were well made. Along with the food menu, they have an extensive drink selection in the form of beers, ciders and wines. Happy hours ends at 8pm, so if you are in the weekend mood, place an early beverage order. Advance reservations are recommended for this place. A special mention to service staff who clearly knew that I had vegetarian food requirements (as I had mentioned during reservation) and they were helpful, provided guidance and followed up when I actually visited the restaurant. 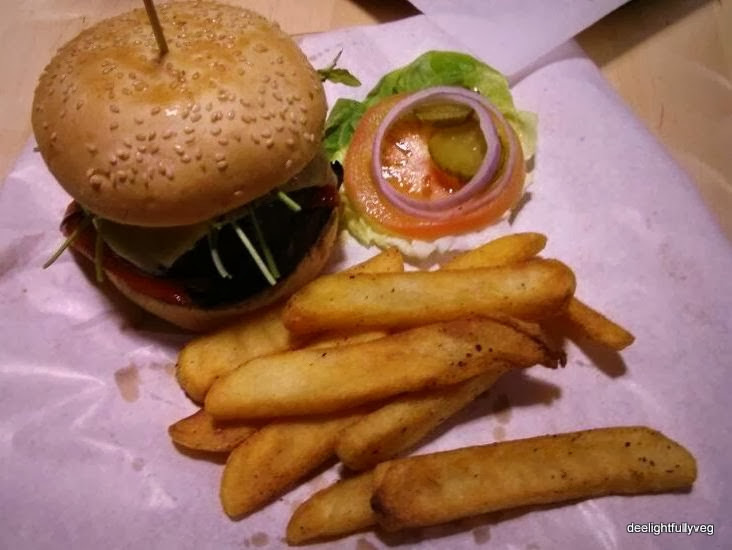 For their superhero memorabilia, for their unique implementation of the themed cafe concept right from decor to the menu, for their service and good food, Hungry Heroes is worth a visit! While roaming at Dhoby Ghaut, I was surprised to find a New Zealand themed eatery hidden in plain sight! Situated at Handy Road in the stretch between Plaza Singapura and the Cathay, Blackbird Bar and Bistro spells charm. The well-done interiors, good music, and friendly welcome by staff elevated the initial impression of the restaurant. There is ample seating space as the restaurant is deceptively large. If you are watching a movie at the nearby theaters or looking for good happy hour deals or brunches, this place shall not disappoint you. Their 1-on-1 cider deals are totally worth getting during happy hours. I was in a bread and cheese kind of mood and ordered the ‘Summer Squash’ sandwich. What I love about a good grilled sandwich is that as you bite into it, the whole combination should be crispy, gooey, salty and comforting in all ways. This sandwich was all that and more. 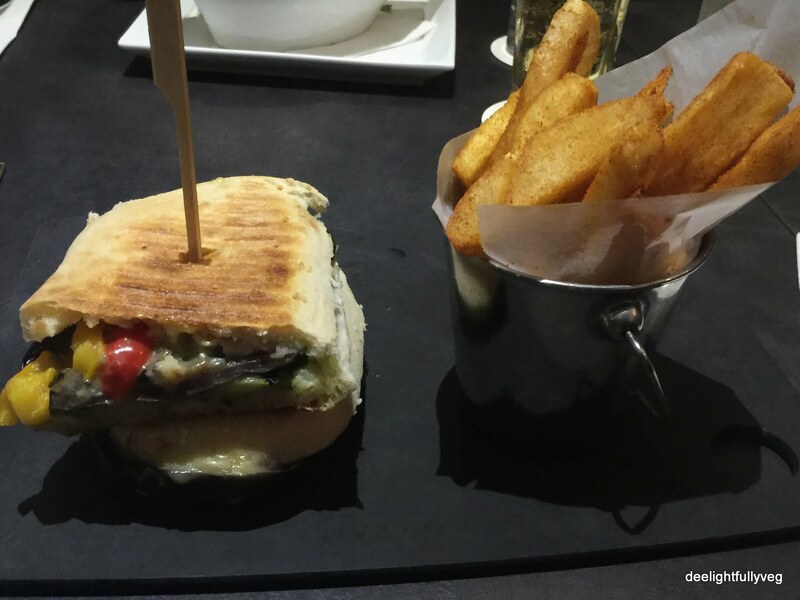 It had grilled aubergines, zucchinis, capsicum, basil pesto and brie on Turkish bread. The bread had a nice panini press feel to it and is worth trying. The fries on the side were well done and this item is quite filling. We also ordered the ‘Rigatoni’ as the pasta main. It was cheesy and piled high with vegetables. The pasta was slightly overdone and the dish needed a little more seasoning. A decent dish, but not one of their best efforts. As we liked the food, we decided to try the desserts as well. Their ‘Fig and Honey Ice cream ‘ definitely looked like something that should not be missed. 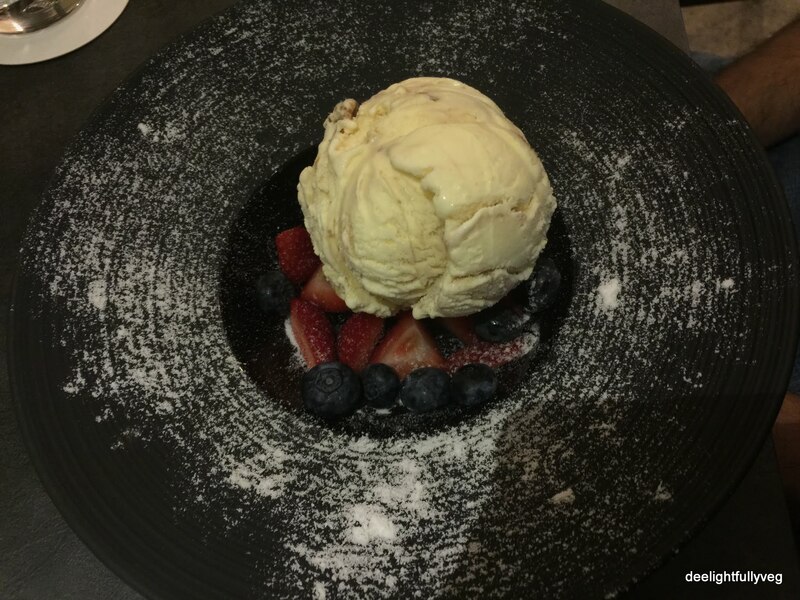 Seated on a soft bed of berries, this huge scoop of ice cream looked regal. The sprinkled icing on the sides made it look like a planet in the solar system. Extremely tasty, highly recommended. Chocolate fans will not be disappointed with the next dessert offering. 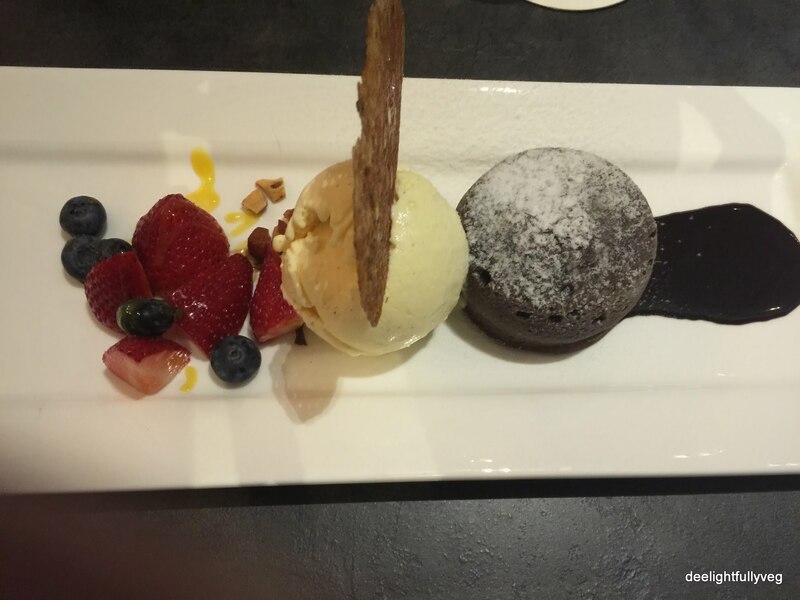 The ‘Lava Cake ‘ was an eruption of luscious chocolate. When we cut into it, the ganache flowed right out of the center. The scoop of vanilla ice cream lent a nice balance. 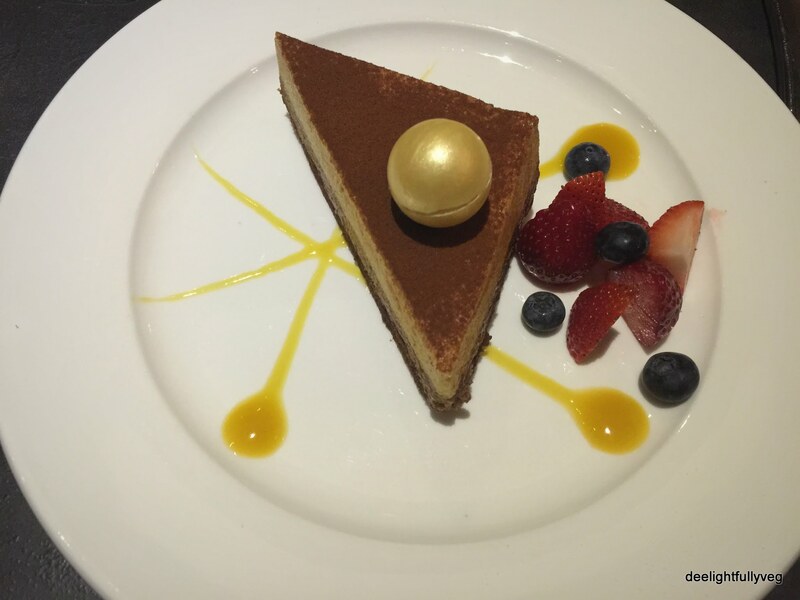 Since the dessert portions were huge and were pocket-friendly, we also tried the ‘Custard Cake’ which was the daily special. I had heard about their charcoal buns and would have liked to try them if Blackbird offered a vegetarian burger on their menu. For their affordable bistro food, top-notch desserts, friendly service and the ambiance, Blackbird Bar and Bistro should not be missed. 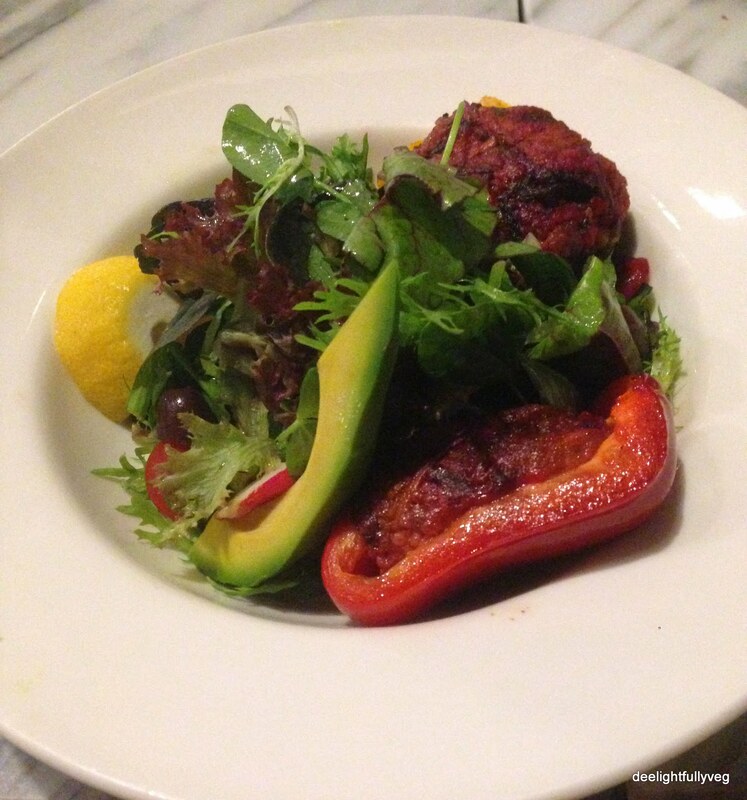 An organic, healthy, vegetarian restaurant coupled with relaxed ambience sounds almost surreal. This place, however, is true to its name. Situated in Orchard Road, is a spacious restaurant called Real Food that will make you feel at ease with its decor and ambiance. The restaurant has two types of seating : sofas and large wooden tables. These sections are bifurcated by a huge wooden book shelf and can accommodate small and large gatherings. I prefer the sofa section as it has a lounge feel and is ideal for long friendly chats. 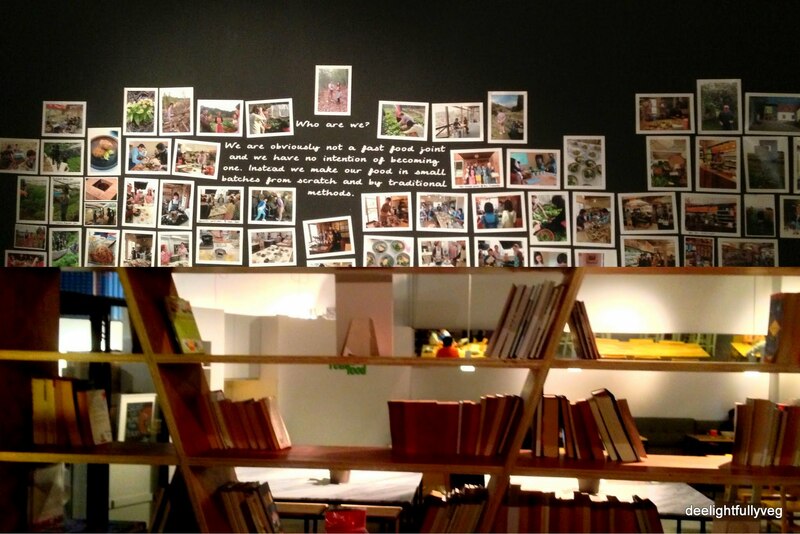 When you are seated on the sofas, you can see a lovely photo collage on the walls facing you and when you turn back, you can grab a book and begin to read. You never know how time passes by at this warmly-lit place. 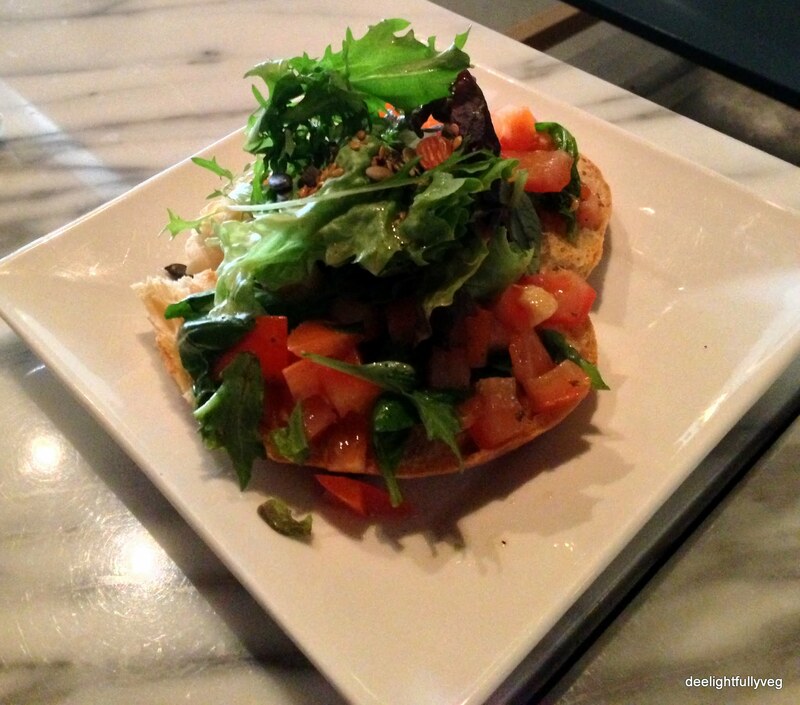 For starters, we decided to go for the ‘Herb Salad on Tomato Bruschetta’. The bread had a nice crunch which contrasted well with the cherry tomatoes, herb and vinegar topping and we gobbled it up in no time. 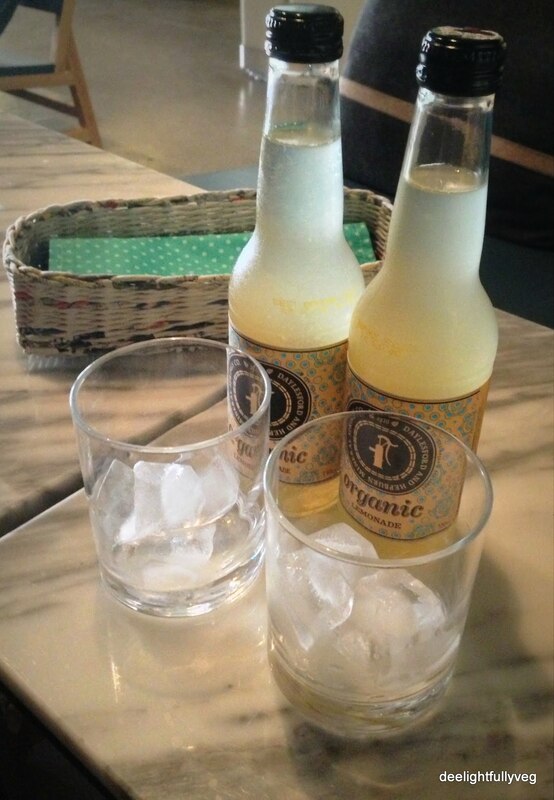 To beat the heat, we also ordered the ‘Organic Lemonade’ at the same time and it was absolutely refreshing. 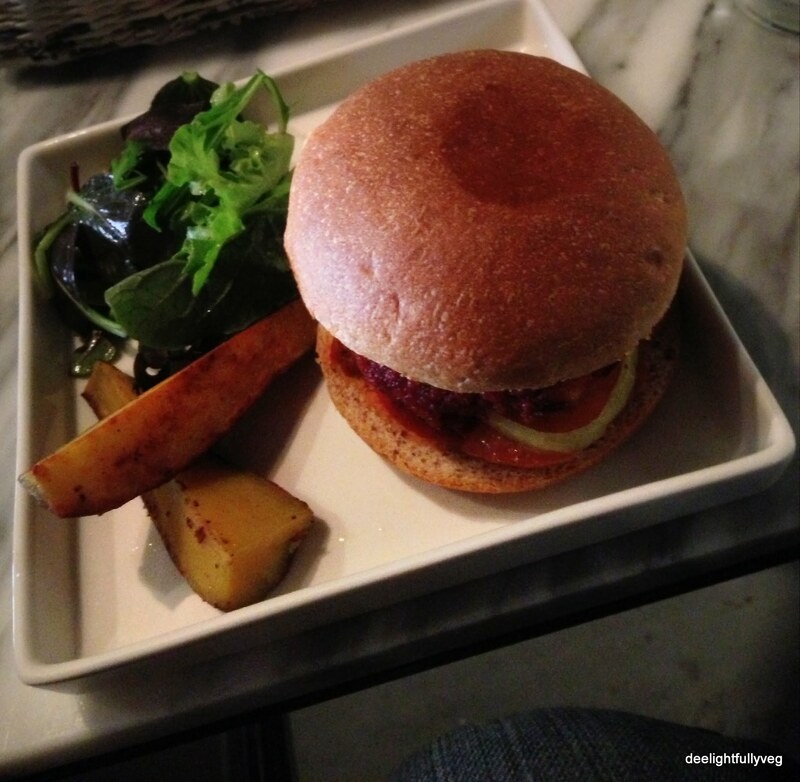 Next, we ordered the ‘Beet (Millet) Burger’ since we had heard so much about it. 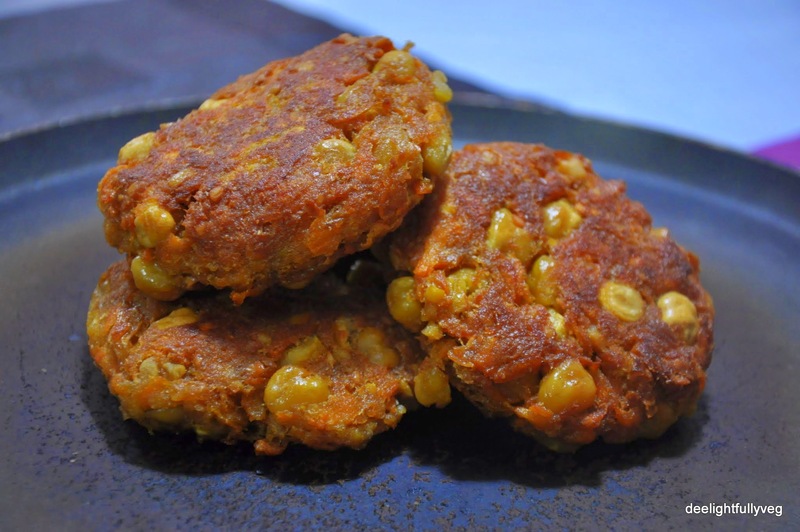 This is a delicious handmade patty made with beetroot, carrot and a combination of other veggies. It is slightly crumbly in nature but quite tasty and I enjoyed the burger. 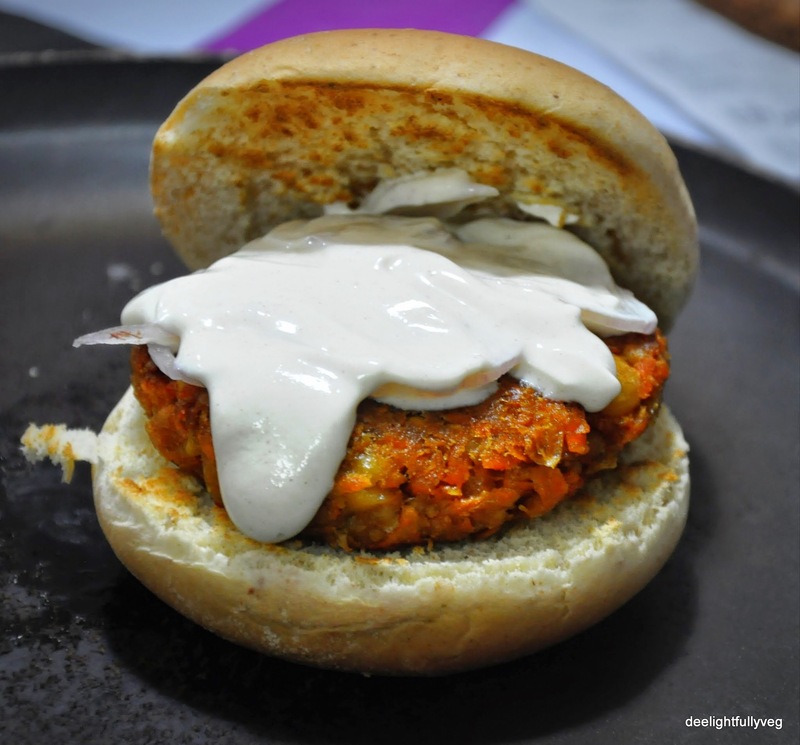 It is served with sweet potato wedges which makes the whole dish an interesting combination. For the next dish, we went for the ‘Balsamic Cherry Tomato Prune Pasta’ which was just OK. The pasta was dry and needed more sauce. It is better to eat it when served hot. Since their menu is quite extensive, it is better to try out other dishes if you are headed there for the first time. My friend ordered the ‘Stuffed Veggie Salad’ which was a beetroot patty with combination of veggies (like the burger), but excluding the bun. It is quite filling on it own and totally healthy. They have some interesting desserts on display at their counter and all of them are gluten-free. 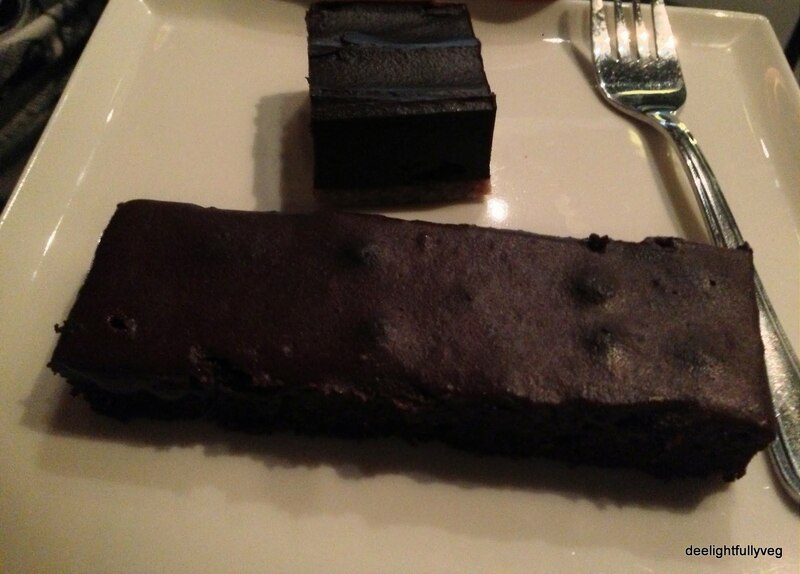 We ordered the ‘Vegan Brownie’ which was a large slab of deliciousness and can easily be shared by two people. We also ordered ‘Chocolate and Date Cake’ which was a small square filled with the rich taste of natural dates and I would totally recommend it. If you are a fan of rice, then the ‘Baked Brown rice’ is recommended. After the meal, you can also shop around the grocery section for organic items. The restaurant sells a variety of chips, coffee beans, teas, honey, juices, sugar, nuts and cooking items. Their menu is crystal clear and states which items are vegan and/or gluten-free. From a healthy vegetarian perspective, for their comfort, ambiance, variety in menu, affordable cost and delicious food, Real Food is totally worth a visit. Situated in Seah Street , this restaurant is a hidden gem. Named after its unit number – 36, Third and Sixth Bistro is the perfect place to unwind with friends after a busy day. One of the first things I noticed was that they were playing the hits of the 90’s and I was almost instantly humming along to the tunes. The tables are large (and broad) with long bench styler seats. Since we had reserved in advance, we were immediately attended to. The staff remembered that I had specifically mentioned egg less mains for me during my phone enquiry for a reservation. That attention to detail has stayed with me. For those who have not figured out yet, I eat eggs when it is used as an ingredient in desserts or bakery items and do not consume it in other forms. The menu instantly appealed to me because of the interesting names and clear descriptions about the ingredients of every dish on the menu. Burgers are famous at this joint and we went for ‘Fungus Among Us’. The patty is replaced with two grilled Portobello mushrooms. 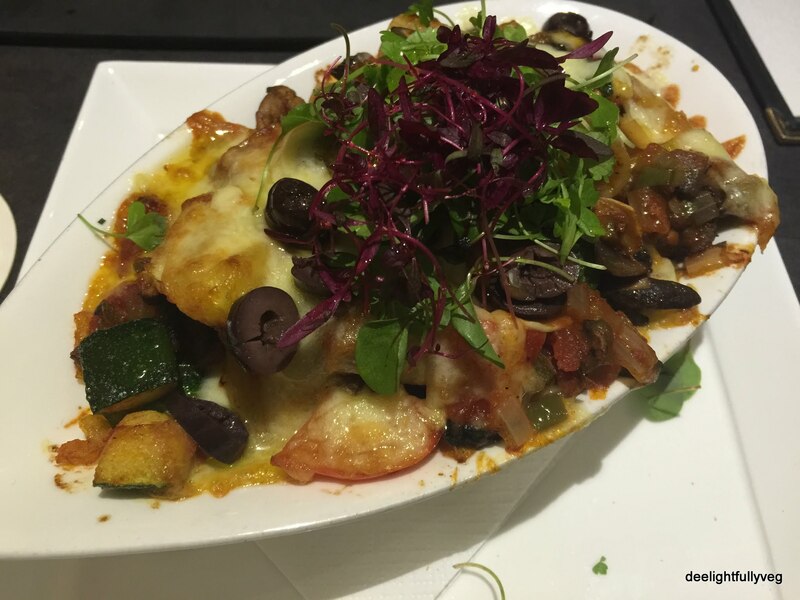 Mushroom lovers can have a go at it along with the option of fries or wedges as the sides. Labelled under ‘Sinless Grub’, ‘Stan Winston’s Head’ struck a chord with me. It had an interesting combination of butternut pumpkin and soy beancurd wrapped in a tortilla. 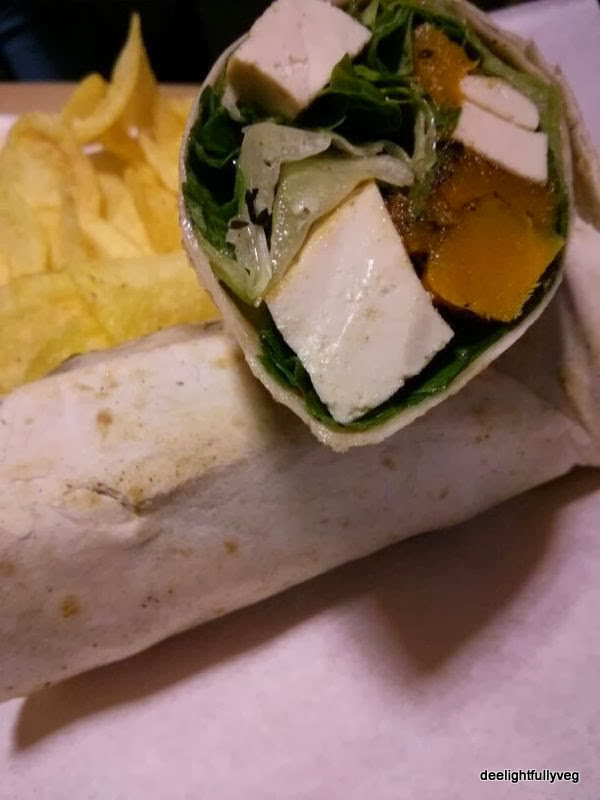 The wrap was delicious and I was intrigued by how completely filling and non-messy it turned out to be. Chips come as crunchy sides to the wrap. 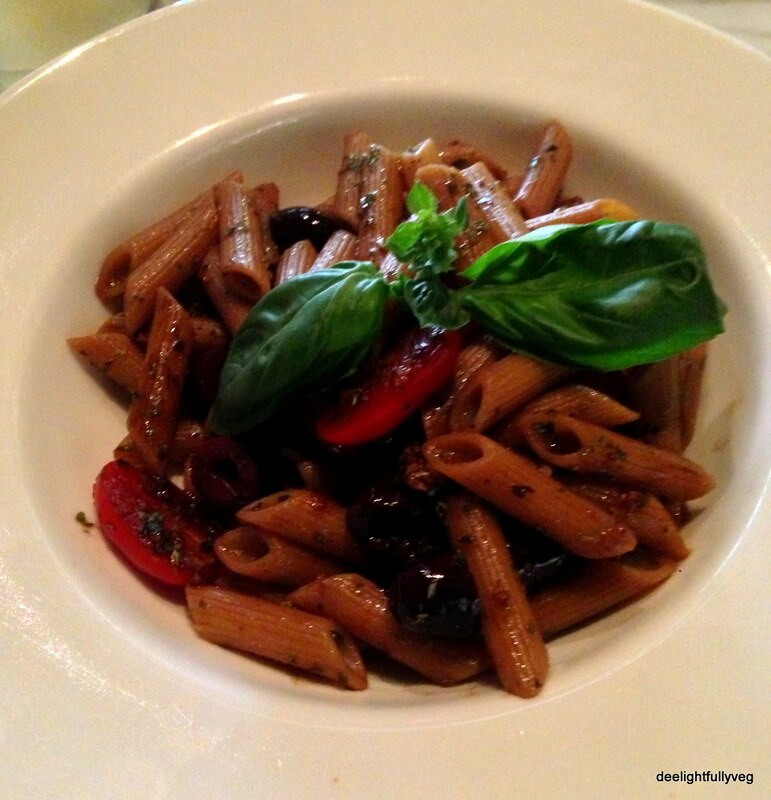 The other dish that we tried was the ‘TM’n’T’ which is their vegetarian pasta offering. 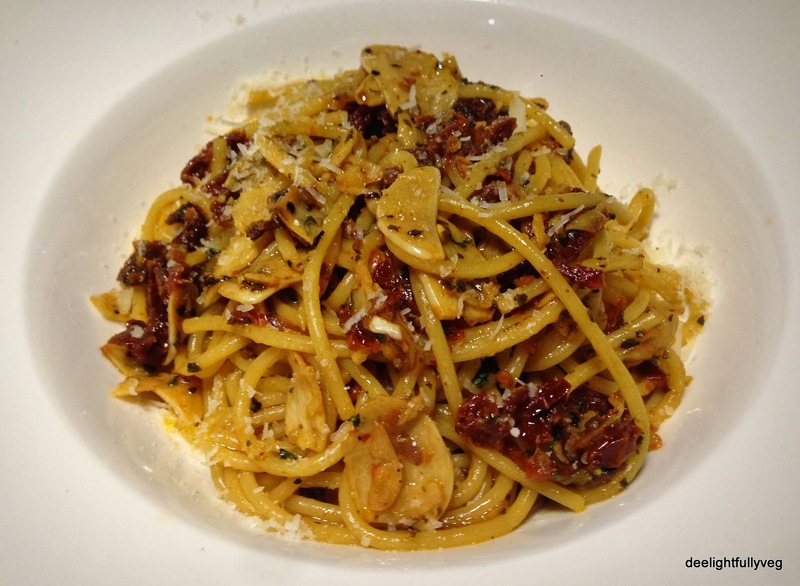 There was nothing unique about the aglio olio pasta and it could have done with some more seasoning. They also have a Soup of the Day. The day we went, it was ‘Potato Soup’. I tried it on a whim – and was very happy that I did. They also offer quite a few ‘Happy Hour’ promotions. The environment exudes camaraderie as it was clearly visible that it was started by three friends who are passionate about their joint. The place has a chill-out ambiance and a kind of instant appeal that makes you want to linger at your table long after the meal is done. Well worth a visit for an evening’s relaxation with some music and friends.